In contemporary scientific terminology, this phenomenon is called "thought contagion" resulting from "morphic resonance of the group mind." British author Dr. Rupert Sheldrake, theorizes that this resonance is "a non-material organizing collective memory field that affects all biological systems. This field can be envisioned as a hyper spatial information reservoir that brims and spills over into a much larger region of influence when critical mass is reached." Unfortunately, I don't see this happening. There seems to be a general dumbing down of people all over the world. The willingness of the American public to blindly follow a mediocre, not-too-bright president into a destruction of the things that made our nation great is an example of what I am talking about. The Republican dominated Senate’s narrow decision to choose another ultra conservative man to fill a vacancy on the Supreme Court, in spite of all the social problems linked to his past, is among the issues in the news this week that seem to support this thought. Looking back a few years, the acceptance of the Bush Administration’s reasoning for the military assault on Iran and removal of Sadam Hussein is yet another prime example. With more than six billion humans existing on this planet, and the numbers growing expedientially by the day, there is more information being transmitted through the collective now than ever before in history. A good example of how the collective influences thought patterns is found in a mythological phenomenon known as the 100th Monkey Effect. As the story is told, a group of Japanese monkeys created the critical mass needed to teach the species a new behavior. It began with the washing of sweet potatoes by the children of the monkey tribe. The behavior was expanded into the older generation of monkeys that also began washing sweet potatoes. 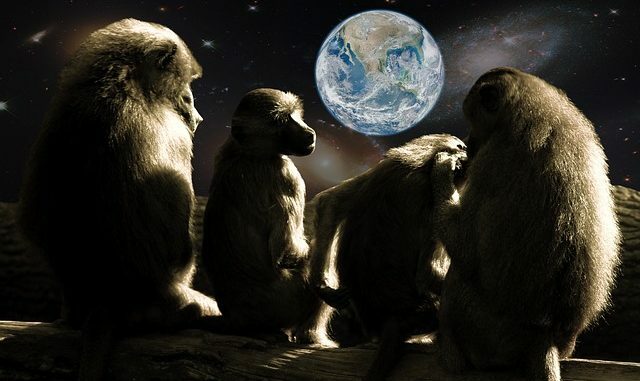 The knowledge spread slowly, but when a certain number of monkeys knew this behavior (the 100th monkey) suddenly the phenomena spread to all the animals. The behavior was adopted throughout the species, even among monkeys that were many miles away and had no contact with the first tribe. And therein lies the crisis faced by the human race today. We have obviously populated the planet to a point of critical mass, or at least gotten so close to that number that the weak minded are already being influenced by the thought patterns of the majority. If we allow ourselves to reach that unknown number . . .is it possible that the 100th Monkey Effect will grip the minds of everyone. It is conceivable then that we, as a race, could, through sheer numbers, fall back to simple left-brain thought. We could be no more than a world of robots without purpose. This leads me to think that the actions of a few world leaders . . . while giving the appearance of total stupidity . . . might have cause. Someone, I hope wiser and smarter than Donald Trump may be pulling strings to make the puppets jump. If my hypothesis is wrong, Trump and those lame-brained Congressional members that followed him into office, may be leading the world right back into the Middle Ages when we lived under the rule of kings and the church. We may learn more during mid-term elections looming next month.